Over at Mahana Designs we usually work with stateless session (meaning that there are no server sessions but instead the user information is repeatedly passed back to the server with each request in the token). Most of our work involves single users making requests from mobile apps, and so a full-scale ACL library isn’t normally necessary, but we include a simple option to allow our clients to easily add one should they later need to. The technique we use is quite simple and relies on a combination of the Laravel Middleware and string comparison. There is absolutely no reason why you couldn’t use this same idea in any other framework. I will try my best to explain this process in framework neutral terms to help you understand how you might modify it to fit your own needs. To start, we’ll pull in Tymon Design’s JWT-Auth package for Laravel. Remember that Json Web Token’s ( JWT) are a standard, not a specific library, and so you have a great many packages in all languages to choose from. 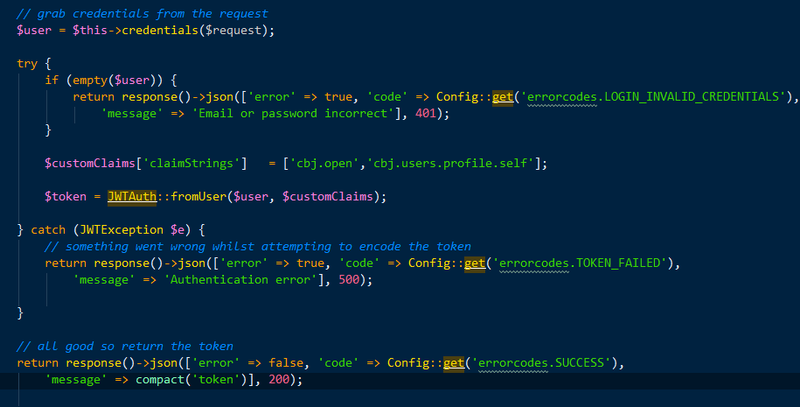 Here’s a fantastic resource to learn more about them and even debug while working: Json Web Tokens. We are no longer relying on setting server sessions during login; instead, we are building a token that we will return and will subsequently be passed along with all of our requests via the Authorization header. 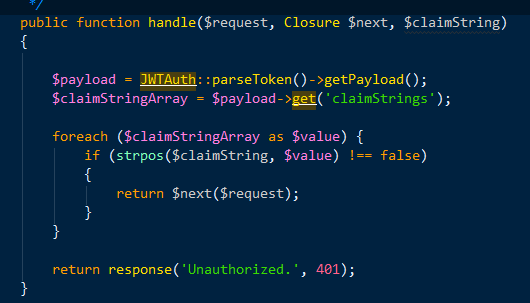 JWT-Auth allows us to easily add additional payload to our token; we will use that to build “claim strings” that store an array of strings representing the ACL privileges we are going to allow this user to have. I’ll explain in greater detail below, but in this example we are giving them “open” and the ability to access their own profile. We check the user credentials normally and return the token. If you are not familiar with loading tokens dynamically into Postman headers, have a look at my Quick Tip post that gives you a full run-down on the procedure. So finally we get to the actual logic of the system. Let us pretend we are accessing the ‘information/latest’ route. Our middleware sees that it should pass the value “cbj.open” to the “acl” middleware (which is registered in our Kernel, as per the documentation). The middleware gets the claim strings from the token payload. You remember that that is just an array of string, [‘cbj.open’, ‘cbj.users.profile.self’]. It will do a check that either passes the $request on to the $next closure, or blocks it. Looking more closely at the handle() function, we see that we are checking if the user has a claim string that is a substring of the one required on the route. For example, a super admin will have the claim string “cbj”. This is found in the string “cbj.users” thereby granting her rights to all user records. A customer, however, will have “cbj.users.profile.self” — not a substring of “cbj.users”- and so they are blocked. A small point that might have you confused looking at the above is that the “.” is just another character and is only used to help make it human-readable. Hope that helps! Feel free to ask me about any part that isn’t clear about this or other aspects of how we create apis.